The 26th exhibition of DIDO that is the group of the illustrator to whom I belong is held. 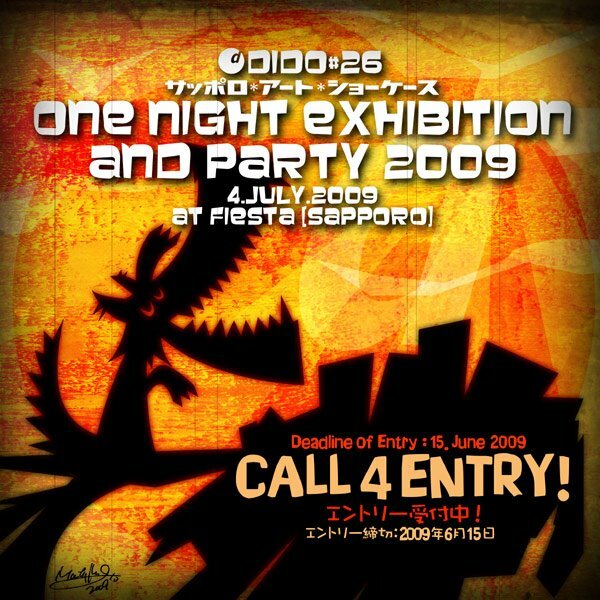 This exhibition is "One Night Exhibition & Party" of great popularity every year. This event is an exhibition of the limit at night. However, the participating artist sells original goods and the work, etc. And, DJ, VJ, and the band, etc. also participate as an exhibitor. Therefore, it is not an exaggeration to say, "Artist's cultural festival"!! This year's site is an event hall of "FIESTA" in the mainstreet in Sapporo. A very good, moderate area to access and the enhanced equipment are attractive places. Everyone can participate in this exhibition. However, a high-quality work is requested. Please click a top image of this topic, and access the information site of DIDO details right now!! Or, You can enter NOW!! The exhibition booths are 50 limited booths. It will be sold out immediately. hehehe Yes, I already reserved 2booths!! Hurry up! to join us! !